I received my PMC Certification from Rio Grande in 2006. I have been working with PMC for 8 years. Since PMC Silver is made from micro-fine particles of pure silver, water and an organic binder in an eco-friendly facility, it is truly a "green" product. 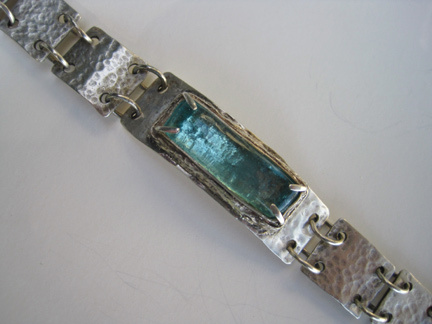 I enjoy combining recycled glass with PMC which I call my "Green Jewelry Collection". In addition to PMC silver, I make jewelry from bronze and copper metal clay. I do lapidary work with rocks and slag (a molten glass like by-product of the iron forges in the area). I either wire wrap my stones and glass or solder traditional settings in sterling silver. I recently have been formfolding copper, German silver and brass sheet metal. I get my inspiration from broken glass and items I find in nature such as leaves, seed pods, flowers, insect wings and vines. 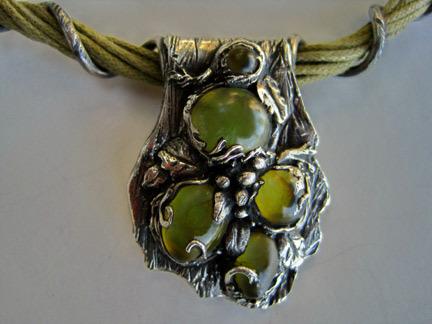 In Forest Treasure, shown at the top of the post, I used recycled safety glass which was kiln fired and then set in PMC attached to a fine silver wire coil to create the vine that wraps around the 5 strand olive green waxed cotton cord and finished with sterling silver and PMC ends. In Blue Canning Jar Bracelet, I slumped a piece of the rim from an antique blue canning jar and set the glass in PMC after the PMC was fired. Its end clasp is magnetic surrounded by PMC with a sterling silver safety chain for security. 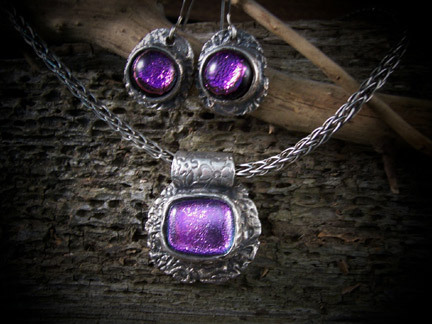 In Mauve Mist, I fused dichroic glass, then fired the cabochons into a pendant and earrings settings made of PMC. I also created the sterling silver woven chain.